Do users in Asia understand how to fill out this form? Sometimes you may have a product or feature that is performing well in some geographies, but causing support tickets in others. Watching a few sessions from your trouble region can lead to quick hypotheses and solutions. Use Inspect Mode to find users who have interacted with the target form. Scope your search to include only users from your target country (or countries) in Asia. 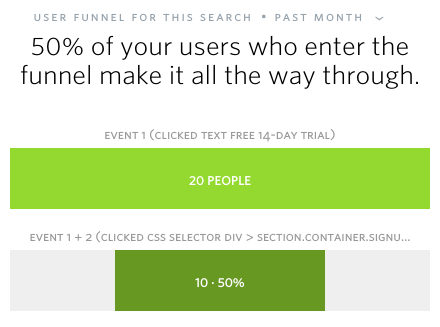 Click on 'View Searchies' to see where you're losing a large number of your users. Watch several sessions with FSTV to form a hypothesis for what is happening. Users are getting confused at the "First Name" + "Last Name" step of the form. In Asia, a more typical pattern would be "Surname" followed by "First Name". We need to fix our form! Do users in Germany use this feature as often as users in Australia? Are North American customers using the most important features in our app? Is usage increasing for customers in Asia?